2015 marked my third full year of blogging. I started the blog in November 2012. Since that time through the end of 2015, the blog has hosted over 45K sessions from over 35K users. I realize this is peanuts compared to the daily traffic of some sites (Facebook probably does that every 5 minutes), but it’s better than the traffic of most personal blogs. Here’s a look at 2015, a few lessons I learned, and what I’m hoping to accomplish in 2016. Here are the number of posts that I’ve written in the past three years along with a month-by-month breakdown of 2015. After hitting 70 the first two years, I wanted to get to 100 this year. I came up quite a bit short, and had lower numbers than last year, but I still managed to get a couple of posts out every month. Here are the most popular posts from the last year according to pageviews in Google Analytics, regardless of whether they were written in 2015 or not. Of these posts, 4 were written in 2015, 4 in 2014, and 2 in 2013. The learning is that if you want to drive consistent traffic to your site, generate timeless content. Chasing around current events is a fool’s game that is dominated by the large media sites. Another interesting point to note is how dominant the top post was over the last year. There were over 60K pageviews registered in 2015. The post about installing DD-WRT on the TP-LINK TL-WR841N was responsible for 77% of those page views. It’s even more impressive when you look at the year-over-year traffic comparisons below to see just how much traffic that one post was responsible for on the blog. In fact, of the over 64K page views that have been registered on the blog since it was started, that one post is responsible for almost 72% of them. The year started off relative slow with only a few hundred sessions a month in January and February. 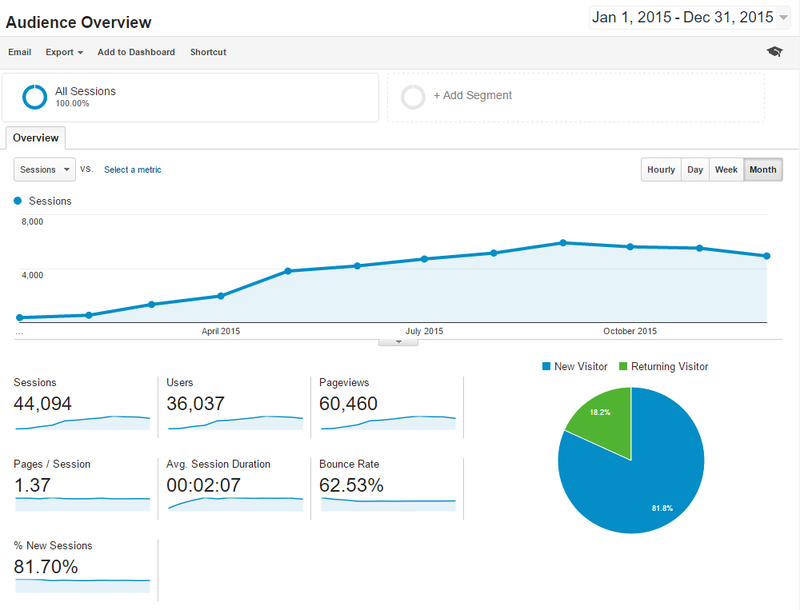 In August, the blog hit over 5,000 sessions for the month and maintained that traffic for the remainder of the year. The finishing total of sessions was just over 44K. It’s pretty amazing how much that one article about installing DD-WRT drove. I published the article at the end of January, and there was a steady increase in traffic from that point until September when things leveled off a bit. Even more impressive is the comparison in traffic between 2014 and 2015. The traffic in 2014 was more or less non-existent and looks like a flat line zero in the Google Analytics comparison chart. 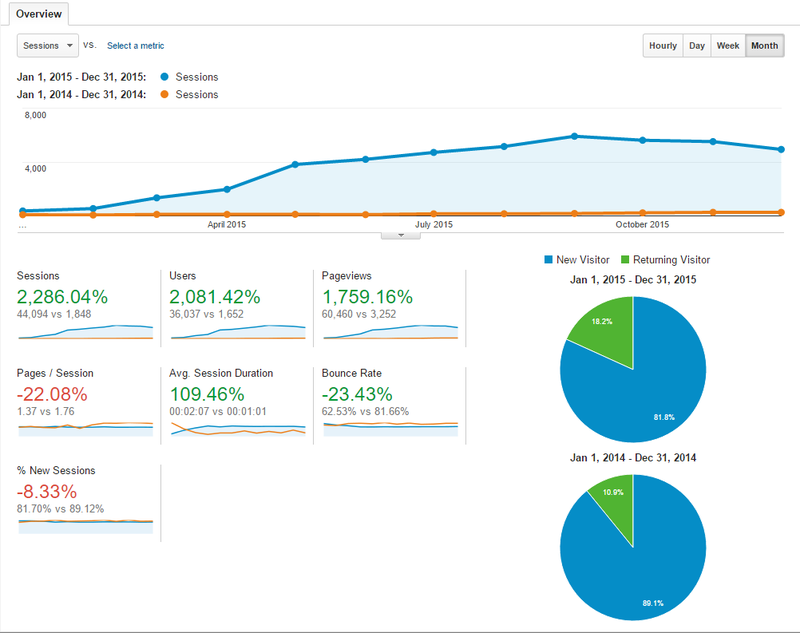 For the year, visits were up over 2,250%, users were up over 2,000%, and pageviews were up over 1,750%. The average session duration doubled, and the bounce rate fell almost 25%. I doubt that 2016 will bring the same growth in traffic, and I’m curious as to how much longer the DD-WRT installation article will draw traffic to the blog. Technology changes fast, and at some point in the near future, that article will be obsolete. It will certainly be an interesting experiment to see what happens. It’s important to Find a Why as I wrote last year. It’s hard to maintain a steady flow of blog articles if you don’t have a good reason to do it. And by the way, chasing traffic shouldn’t be one of them. I didn’t try to get traffic this past year. Installing DD-WRT on the TP-LINK router was not written to draw traffic. I wrote it because I wanted to remember how to do it in case I bought a second router, and I figured it might help a person or two who might want to do the same thing. I had no idea it would be viewed 48,000 times. Being persistent and maintaining a consistent blogging rhythm are important. If you are interested in having any traffic to your blog, it will only get indexed if content is generated on a regular and consistent basis. I’ve made a couple of connections through blogging that have recommended books and offered interesting advice and tips. I’m not suggesting that will happen if you start a blog, but I’m certain it won’t happen if you don’t have one. I’ve had many conversations with people about books, biking, hiking, or other things where I’ve been able to point them to articles on my blog. In other words, it served as a great resource that I can offer to people rather than rambling on about things. Also, I’ve found myself referring to my own articles for reviewing past books, remembering what I read, checking on recipes, or other things. If you would have asked me when I started the blog which types of articles would be popular, anything I would have said back then would have been wrong. In fact, I have no idea what articles might be popular over the course of the this year. I have a feeling my most popular article will stay in first, but behind that, who knows? I’m finding that long tail searches that uncover timeless articles drive the traffic to my blog. When I review search patterns in Google’s Search Console, the terms tend to be very specific in what they are looking for. I have a feeling that’s true across most sites. I’m going to strive for 100 posts again, even though I came up short last year by a large margin. I’m off to a decent start with 8 already completed in January, so there’s still hope. I started a new category last year called Startup Lessons. I didn’t generate nearly as much unique material as I wanted for that category, so I’m going to redouble my efforts in 2016. The design hasn’t changed since the 2012 launch. I still like it, but it’s gotten a little stale. I’m hoping that I can update it during 2016. I want to add a page or section to the site that makes use of Custom Post Types. I’ve seen a couple of presentations on custom post types in WordPress, and it would be a good learning experience to setup a custom post type for something like books, which I could then turn into a dedicated section on the blog. 2015 was a great year for the blog. I would have never imagined that I would have seen a 20x increase in traffic from 2014. While I didn’t get as many articles written as I wanted, I was still able to maintain some consistency throughout the year. I’m looking forward to continuing to blog and what lessons I’ll learn in year 4 of the blog. This entry was posted in Life Journal on January 30, 2016 by Gregg Borodaty.